Beatons Blog : Celebrate our #generousvalue Afternoon Tea Week and feel Distinguished! Celebrate our #generousvalue Afternoon Tea Week and feel Distinguished! We love Afternoon Tea Week (10th - 16th August) - a chance to feel elegant and gracious while feasting on three tiers of scrummy cakes and scones! This year, everyone taking Afternoon High Tea at any Beatons Tearooms and Bookshop during Afternoon Tea Week will receive a FREE First Edition signed copy of Liz Darcy Jones's best-seller, 'Distinguished Leaves' (worth £7.99). This sweet little hardback tells you all about tea in the most delightful way and includes a charming foreword by Nigel Havers. We thought it would add a splash of #generousvalue to your Afternoon Tea. It would make a lovely way to say thank you to a family member or friend, prompt you to have a long overdue 'girls together' tea-party and have a keepsake to take home too! P.S. 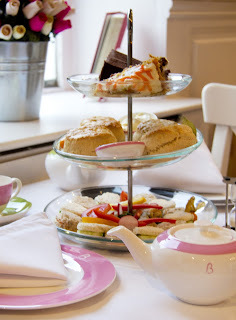 Win Afternoon Tea for Two! If you're on Twitter, follow us at @beatonschester @beatonsblandford or @beatonstearooms for Tisbury and retweet our #generousvalue tweet to be in with a chance of winning Free Afternoon Tea for Two. Offer applies to each Beatons Tearooms and Bookshop, and your chance runs out at mid-night on Sunday 9th August. Good luck and see you soon! #beatonsbod: Shellie - Tisbury Tearoom Tiger!